- We've read every single book that we'll be bringing to your school so parents and teachers can be certain that the kids will be getting the best, most exciting books possible. - We'll bring the newest books available to your school. It'll be like having a New Arrival section of a bookstore right in your canteen. - We love it when we're able to surprise kids with books that they've never expected so we've eschewed mass market titles (Geronimo Stilton, Minecraft and the like) in favour of awesome stories that you won't be able to find anywhere else. 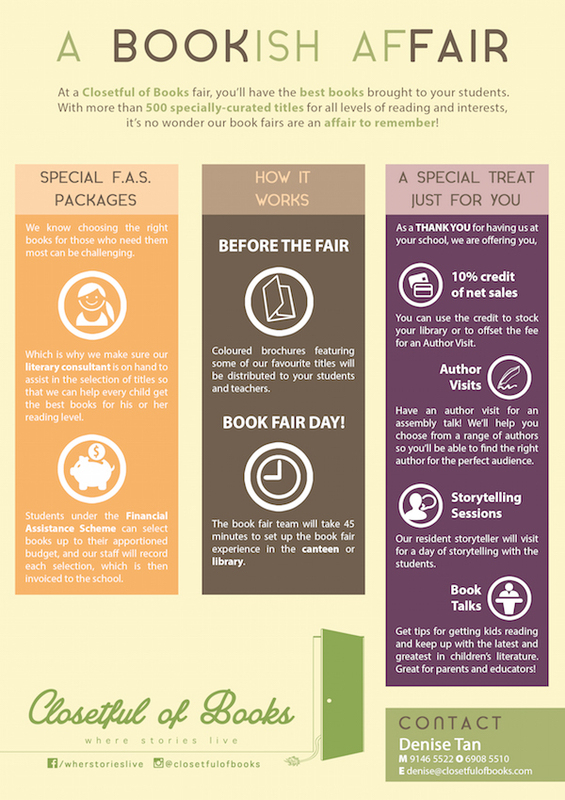 ​​- You'll have the option of having your librarian, English HOD or parent coordinator tailor the book fair's inventory to meet your school's needs and preferences. ​​Have a bookish affair with us! Call 6908 5510 or email stories@closetfulofbooks.com. We're looking forward to expanding your reading repertoire!